Bellave Narahari Sastri was a great dramatist and musician who defined and set the standards for professional playwriting in Kannada theatre. 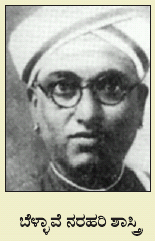 Bellave Narahari Sastri was born in 1882 and was conferred his education in Tumkur, Karnataka. He worked as a teacher, education inspector and headmaster in certain government schools for a span of 40 years. All this while, from 1910 to 1950, Bellave Narahari Sastri wrote over 30 plays from which around 10 remain unpublished. Bellave initially started writing for the Gubbi Veeranna’s company that travelled all over the state of Karnataka giving several performances. Gubbi’s company had first come to Bangalore in 1886 and soon became synonymous with Kannada theatre itself. The company’s contribution to theatre can be analysed from the fact that more than 300 actors/actresses of that time had worked with Gubbi Veeranna’s company at one time or other. The plays written by Bellave Narahari Sastri were mostly based on mythological themes and encompassed stories from the Ramayana, Mahabharata and Bhagavat Gita. He also wrote independently about the ‘Bhakti Samrajya’ or the Bhakti Empire and his stories depict the lives of heroes from the Bhakti movement who attempted and brought about social change and criticism. His plays were adorned with good songs set to classical Carnatic music and the moods in his plays were at times satirical and intense, and at times down to earth and comical. His characters were taken from classical Kannada and Sanskrit literature and were endowed with possibilities, miracles, divinations and ideals. Apart from writing several plays that were later cinematised, Bellave also wrote scripts and screenplays for certain Kannada films, including the first among the most acclaimed Kannada movies, Sati Sulochana in 1934. Sati Sulochana was the first Kannada talkie feature film. His other famous plays include Sadarme, which is still frequently staged by several theatre troupes all over the country, and Hemmareddy Mallamma which became quite prominent during the 1940s. Apart from being a dramatist of national acclaim, Bellave Narahari Sastri also composed music for some of the most mellifluous Kannada melodies of that time. He composed the music for Sati Sulochana along with R Nagendra Rao and also composed music for several other plays and movies. Bellave Narahari Sastri passed away in the year 1951 but his contribution to Kannada literature and Kannada music will always echo among the theatrical troupes all over India.